Bruderer BBV190H Feed – These entirely mechanical units have been epitomising precision and reliability for decades. 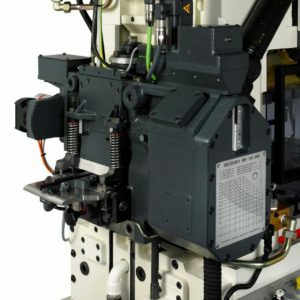 They are driven by the main shaft of the punching press via a cardan shaft angle-synchronously to the strip feed unit. The feed works with oscillating rollers to generate the feed movement and with clamping bars that hold down the strip during the punching process. The feed length can be set steplessly. The strip lifting device allows the accurate and continuous transfer of raw punching materials to the centring pins in the punching tool. The punching press’s central lubrication system manages lubrication and cooling. Bruderer Precision BBV180 Feed – These entirely mechanical units have been epitomising precision and reliability for decades. Bruderer BBV202 Feed – These entirely mechanical units have been epitomising precision and reliability for decades. 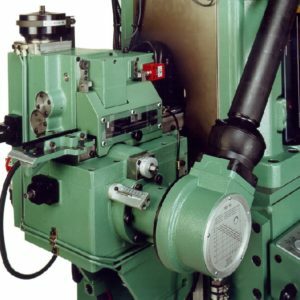 They are driven by the main shaft of the punching press via a cardan shaft angle-synchronously to the strip feed unit. The feed works with oscillating rollers to generate the feed movement and with clamping bars that hold down the strip during the punching process. The feed length can be set steplessly. The strip lifting device allows the accurate and continuous transfer of raw punching materials to the centring pins in the punching tool. The punching press's central lubrication system manages lubrication and cooling. 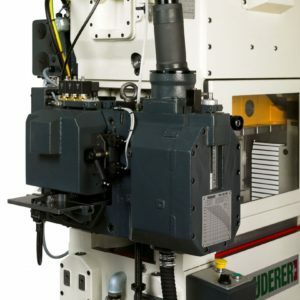 Bruderer Precision Servo Feeder BSV– The embodiment of advanced technology. These entirely mechanical units have been epitomising precision and reliability for decades. 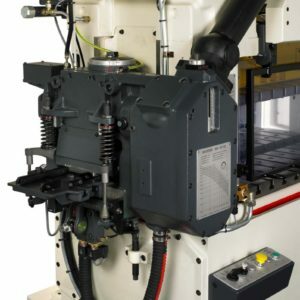 They are driven by the main shaft of the punching press via a cardan shaft angle-synchronously to the strip feed unit. The feed works with oscillating rollers to generate the feed movement and with clamping bars that hold down the strip during the punching process. The feed length can be set steplessly. The strip lifting device allows the accurate and continuous transfer of raw punching materials to the centring pins in the punching tool. The punching press’s central lubrication system manages lubrication and cooling. Capable of feed lengths from 10-210mm and material widths up to 200mm. The Bruderer Precision BZV 61 Gripper Feed unit was specially designed with sensitive and thin metal strips in minds. It protects the surface of the strip thanks to the large support surface of its clamps. Bruderer BBV450 Feed – These entirely mechanical units have been epitomising precision and reliability for decades. Bruderer BBV325 Feed – These entirely mechanical units have been epitomising precision and reliability for decades. They are driven by the main shaft of the punching press via a cardan shaft angle-synchronously to the strip feed unit. The feed works with oscillating rollers to generate the feed movement and with clamping bars that hold down the strip during the punching process. The feed length can be set steplessly. The strip lifting device allows the accurate and continuous transfer of raw punching materials to the centring pins in the punching tool. The punching press's central lubrication system manages lubrication and cooling. Bruderer BBV320 Feed – These entirely mechanical units have been epitomising precision and reliability for decades. 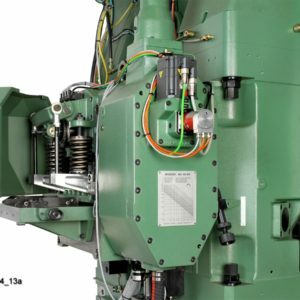 They are driven by the main shaft of the punching press via a cardan shaft angle-synchronously to the strip feed unit. The feed works with oscillating rollers to generate the feed movement and with clamping bars that hold down the strip during the punching process. The feed length can be set steplessly. The strip lifting device allows the accurate and continuous transfer of raw punching materials to the centring pins in the punching tool. The punching press's central lubrication system manages lubrication and cooling. Bruderer BBV260 Feed – These entirely mechanical units have been epitomising precision and reliability for decades. 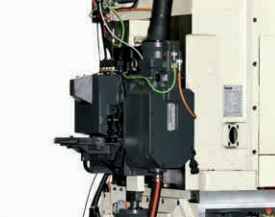 They are driven by the main shaft of the punching press via a cardan shaft angle-synchronously to the strip feed unit. The feed works with oscillating rollers to generate the feed movement and with clamping bars that hold down the strip during the punching process. The feed length can be set steplessly. The strip lifting device allows the accurate and continuous transfer of raw punching materials to the centring pins in the punching tool. The punching press's central lubrication system manages lubrication and cooling. Bruderer BBV205 Feed – These entirely mechanical units have been epitomising precision and reliability for decades. 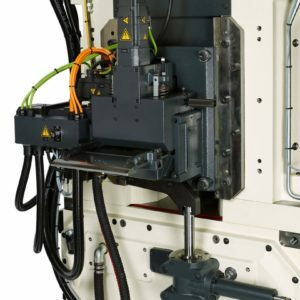 They are driven by the main shaft of the punching press via a cardan shaft angle-synchronously to the strip feed unit. The feed works with oscillating rollers to generate the feed movement and with clamping bars that hold down the strip during the punching process. The feed length can be set steplessly. The strip lifting device allows the accurate and continuous transfer of raw punching materials to the centring pins in the punching tool. The punching press's central lubrication system manages lubrication and cooling. Bruderer BBV195H Feed – These entirely mechanical units have been epitomising precision and reliability for decades. 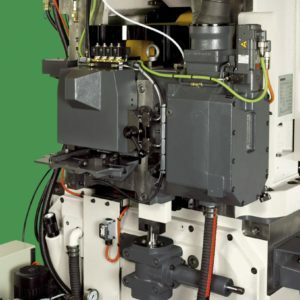 They are driven by the main shaft of the punching press via a cardan shaft angle-synchronously to the strip feed unit. The feed works with oscillating rollers to generate the feed movement and with clamping bars that hold down the strip during the punching process. The feed length can be set steplessly. The strip lifting device allows the accurate and continuous transfer of raw punching materials to the centring pins in the punching tool. 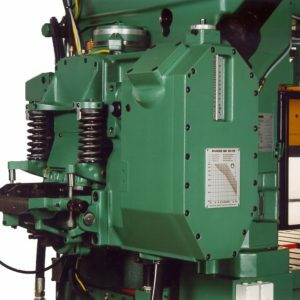 The punching press's central lubrication system manages lubrication and cooling.